Robert Glassman is a trial attorney at Panish Shea & Boyle LLP where he litigates large and complex personal injury, wrongful death and product defect cases on behalf of individuals. He has been named a “Rising Star” by Super Lawyers magazine since 2013 and has received numerous other awards and accolades for his legal and leadership work within the Los Angeles legal community. 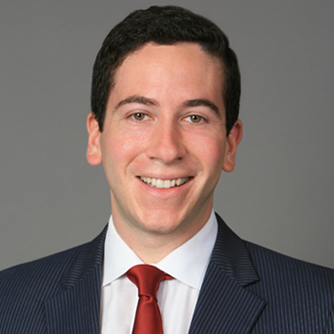 In 2016 and 2017, Mr. Glassman was selected as one of the “Up-and-Coming 100 Southern California Rising Stars”— the list of lawyers who ranked at the top of the Super Lawyers’ Rising Stars list. Diao v. Southern California Gas Company (Los Angeles jury awarded $19,786,818 verdict to injured plaintiff following a gas explosion at home in San Gabriel, CA). The judgment was recently upheld on appeal. Crenshaw v. Land O’Lakes, Inc. (Kings County jury awarded $6.45 million verdict to Corcoran State Prison correctional officer after motorcycle crash in Hanford, CA). For the work Mr. Glassman and firm partner Brian Panish did on the Crenshaw case, it was recognized by The Daily Journal as a Top Ten Verdict of 2010. Mr. Glassman has also recovered millions of dollars for his clients in settlements against some of the nation’s biggest food and beverage companies, real estate companies, utility companies, hotel chains, automotive and trucking companies and local, statewide and national public entities. Prior to working at Panish Shea & Boyle, Mr. Glassman clerked at the Los Angeles County District Attorney’s Office in the Major Crimes Division where he worked on high profile murder prosecutions and in the Preliminary Hearing Unit where he conducted dozens of preliminary felony hearings. Mr. Glassman also previously worked on Los Angeles City Attorney Mike Feuer’s Gun Violence Prevention Task Force. Mr. Glassman attended Bucknell University in Lewisburg, PA where he obtained his B.A. degree in English. 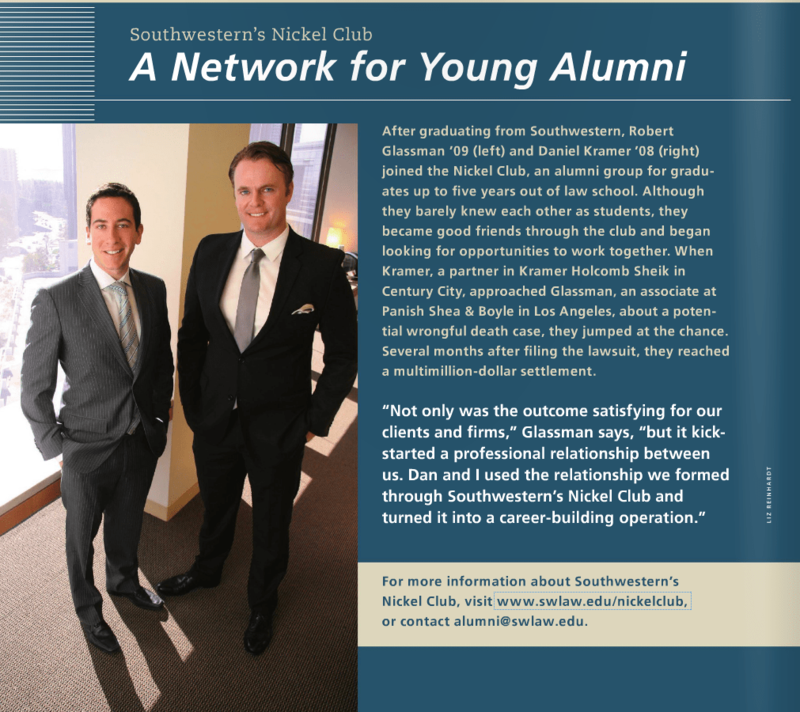 Following college, Mr. Glassman obtained his law degree from Southwestern Law School in Los Angeles where he served as president of the student body, and was a member of the Trial Advocacy Honors Program. Mr. Glassman is dedicated to giving back to his community and the legal profession. He is on the board of the Brentwood Community Council and previously served as the president of the Los Angeles County Bar Association Barristers Section. He is also actively involved in other local, statewide and national bar associations and public interest groups including the Consumer Attorneys Association of Los Angeles (CAALA), the Consumer Attorneys of California (CAOC), National Crime Victim Bar Association and Bet Tzedek. He also volunteers his time at the Stephen Wise Temple’s Center for Social Justice. Class President, Bucknell University, Lewisburg, PA.
Senior Class President, Whitfield School, St. Louis, MO. Mr. Glassman is admitted to practice law in the District of Columbia, California and United States District Courts throughout California. Watch and read news report on lawsuits involving exploding e-cigarette lithium batteries featuring Mr. Glassman here. Read about the Agu v. UC Regents case here and here. Watch a Welcome Message from Barristers President Robert Glassman here. Mr. Glassman delivered the 2016 Orientation keynote address at Southwestern Law School. Los Angeles Lawyer – Party’s Over Article written By Robert Glassman and Kevin Boyle. Los Angeles Lawyer – Robert Glassman discusses Proposition 213 and its broad interpretations, as well as surviving remedies and theories. Plaintiff Magazine – Robert Glassman and Kevin Boyle discuss the liability under Business and Professions code section 25602.1 and three key strategies. Los Angeles Lawyer – Robert Glassman discusses steps to file a strong motion to compel and get the answers you deserve.